Commercial Slate Floor Cleaning Bristol & UK / CleanAndSealUK. A Commercial Slate Floor Cleaning Bristol Service That Cares. You have a wicked looking slate floor in your commercial property that now needs some slate floor care. Give us a call and find out exactly what commercial slate floor cleaning Bristol service we can offer you. We know how hard cleaning commercial slate floor tiles can be and how difficult it can be to remove stubborn stains and blemishes. You may already know that cleaning commercial slate floors is a tedious job that needs doing otherwise it can soon look dull and neglected. We can help you. With our unrivalled commercial slate floor cleaning methods we can clean any slate floor to make it look like new once again. Commercial Slate Floor Cleaning And Sealing Services For Bristol and the Southwest. Are you looking to have your slate floor cleaned and then have a slate floor sealer applied? If you don’t keep your slate floor sealed it won’t stay protected and can soon become full of grime and tacky underfoot and in some cases even smell with germs and bacteria hanging around. 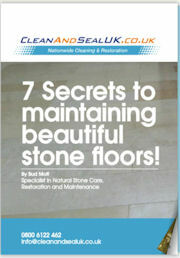 CleanAndSealUK offer you a slate floor clean and seal service that other companies envy. You will find us totally honest and we will respect your property at all times when you use us for your slate floor cleaning and sealing. Have you had your slate floor sealer removed before and re-applied? Did you tackle it yourself and found it extremely hard work? Are you considering slate floor restoration and wondering what it involves? Then try the CleanAndSealUK slate restoration service. You will be amazed with our slate floor restoration service. The finishes we have achieved are outstanding. You won’t be disappointed with our full sealer removal treatment. We can remove old slate floor sealers on any slate floor type. With our equipment and knowledge we can make easy work of any slate floor restoration with the smallest inconvenience to you. If your slate floor is damaged and needs replacing in areas then let us know. It can be restored not just replaced. And once your slate floor is totally dry we will apply a top quality slate floor sealer to the floor making sure it looks absolutely stunning but more importantly with total slate floor protection.